New images from Mars Global Surveyor indicate Phobos is covered with a layer of fine dust about a metre thick. The Soviet spacecraft Phobos 2 detected a faint but steady out-gassing from Phobos. Unfortunately, Phobos 2 failed before it could determine the nature of the material. Phobos is slowly being pulled closer to Mars (1.8 metres per century), and in about 50 million years it will either crash into the surface of Mars or break up into a ring. Deimos, on the other hand, appears to be getting further from Mars, slowing down as it does so. same face turned towards Mars. If you were standing on Mars's equator you would see Phobos rising in the west, move across the sky in only five and a half hours, and set in the east, usually twice a day. Deimos takes about two and a half days to cross the Martian sky. Both moons are heavily cratered. Phobos has one large crater called Stickney (named after Angelina Stickney, Hall's wife) that is 10 km wide. 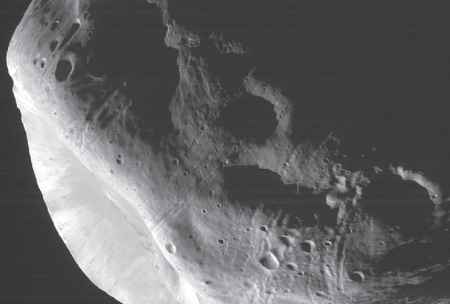 The grooves and streaks on the surface of Phobos were probably caused by the Stickney impact. Deimos is less cratered than Phobos. The largest crater on Deimos is only 2.3 km across. It is thought that these two moons may have been asteroids captured by Mars's gravitational field. Evidence to support the asteroid theory is that both moons reflect very little of the light that falls on them and they are very light for their size. The cratering on each moon suggests their surfaces are equally old - about three billion years. They are similar to C-type asteroids, which belong to the outermost part of the asteroid belt.